electrode. 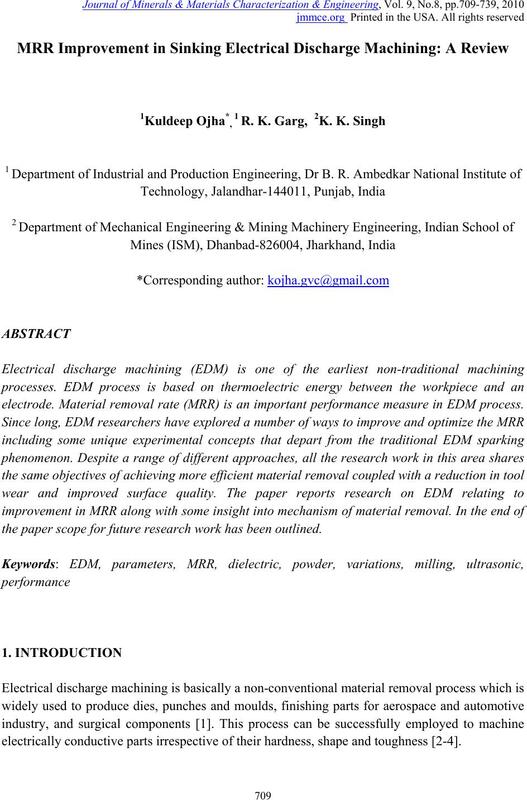 Material removal rate (MRR) is an important performance measure in EDM process. the paper scope for future research work has been outlined. electrically conductive part s irrespective of their hardness, shape and toughness [2-4]. EDM research as a novel contribution to the archival literature. reference voltage, which is the case for smaller gap widths resulting in a smaller ignition delay. capacitors as shown in Fig. 2. . 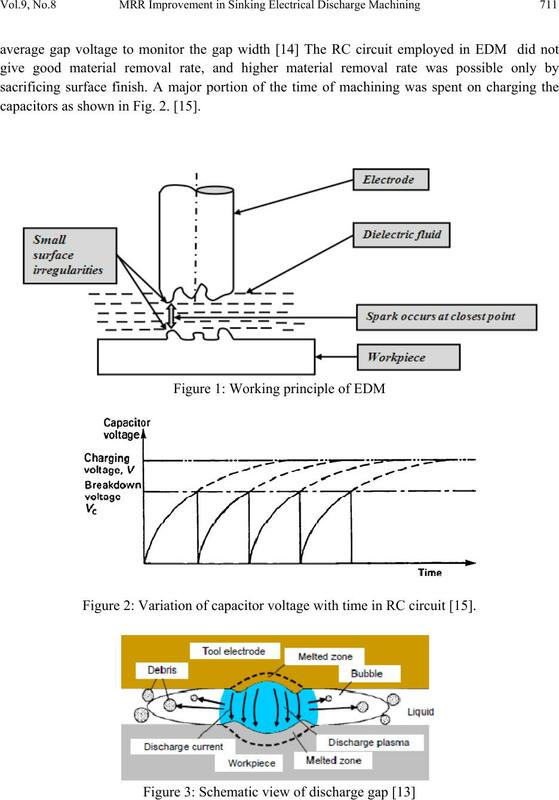 Figure 2: Variation of capacitor voltage with time in RC circuit . the ideal EDM process [26-28]. rotation. These non electrical parameters play a critical role in optimizing performance measures. as coolant and also plays a vital role in flushing away the debris from the machining gap [29-31]. MRR and SR has been reported due to effective gap flushing by electrode rotation [34-36]. 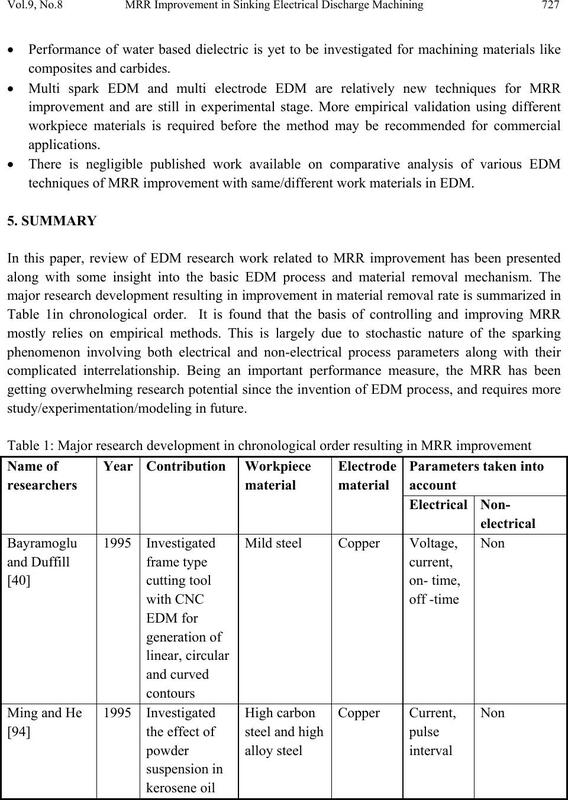 been focused on material removal mechanism [37-39] and methods of improving MRR [40-43]. made to overcome the unavailability of experimental data at that time was quite significant. 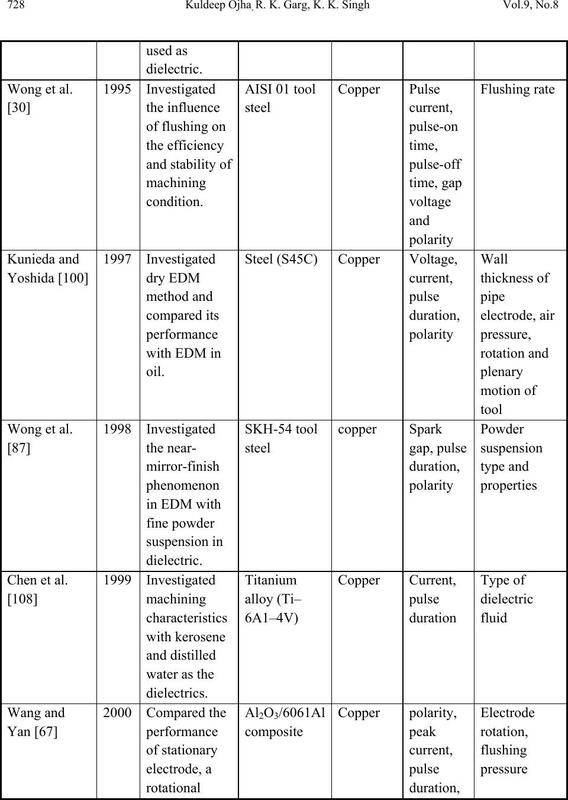 the phenomena that occur during electric discharge machining in terms of heat transfer theories. a series of three research papers. material. Furthermore, the area upon which the flux is incident was assumed to grow with time. inclusion of the heats of dissociation and ionization for a plasma created from demonized water. varying discharge duration, for short pulses. re-solidified layer [38, 39, 50, 63-65]. the light of the many available models, it appears that this mechanism is not yet well understood. 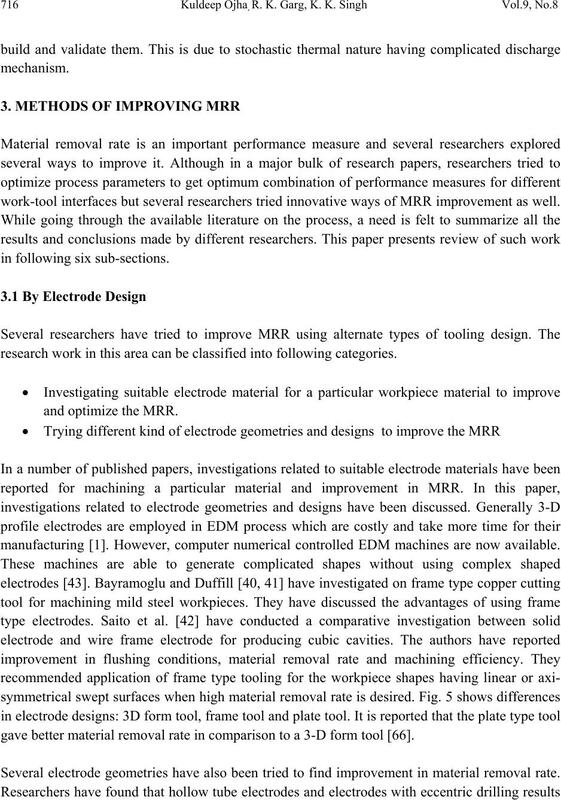 work-tool interfaces but several researchers tried innovative ways of MRR improvement as well. research work in this area can be classified into following categories. manufacturing . However, computer numerical controlled EDM machines are now available. gave better material removal rate in comparison to a 3-D form tool . 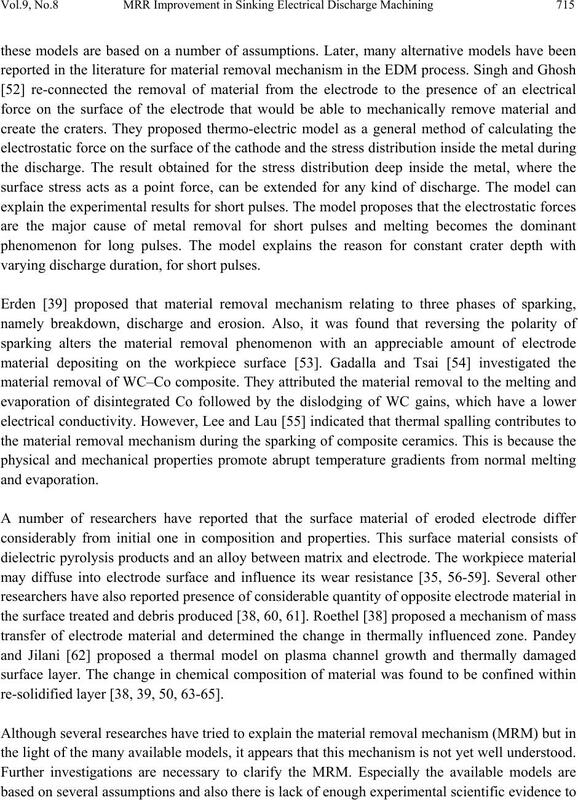 Several electrode geometries have also been tried to find improvement in material removal rate. sweeps) and intermediate (complex 2D sweeps, ruled surfaces, and fillets) shapes . 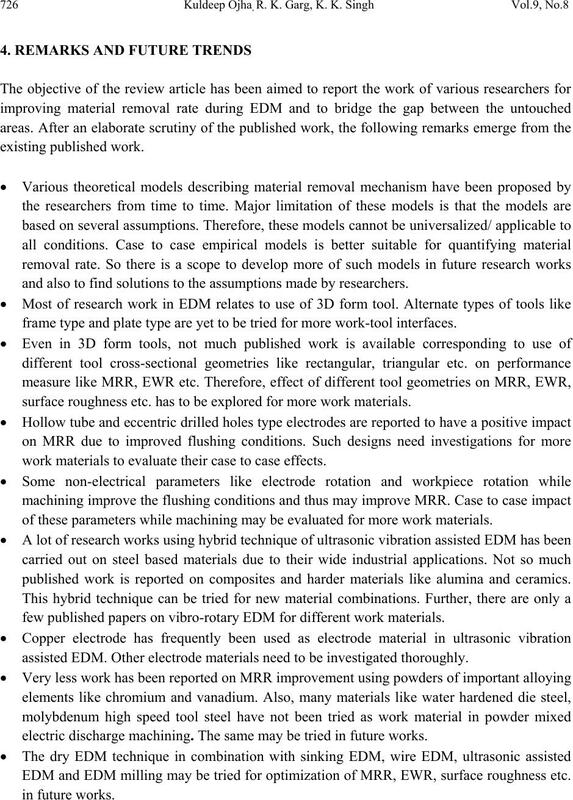 scientific investigation of electrode design is needed to be developed for industrial application. The material removal rate can be controlled and improved by controlling process parameters. voltage resulting in higher MRR. and surface quality. Higher peak current setting is applied for roughing operation. resulting in unstable next spark. Material removal rate is highly affected by types of dielectric and method of flushing . rotation, increasing flushing pressure, and tube electrode design. widely used in industry in application of EDM technology. 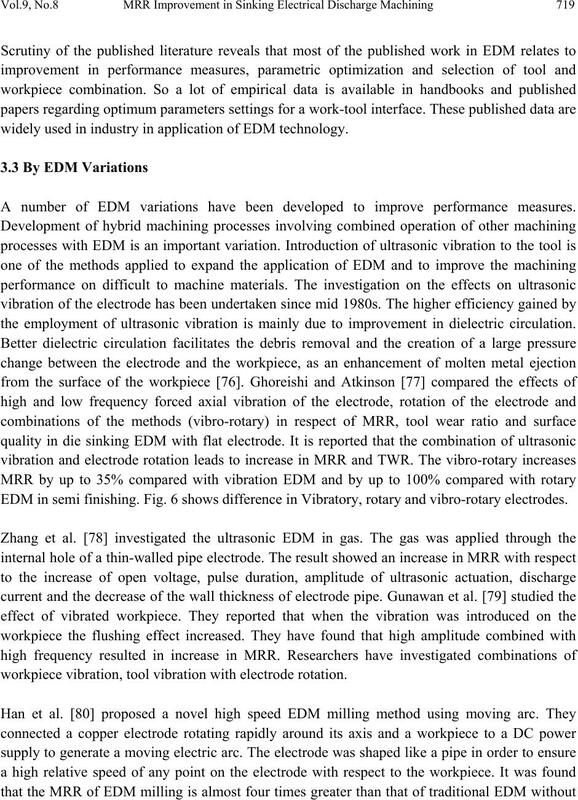 A number of EDM variations have been developed to improve performance measures. 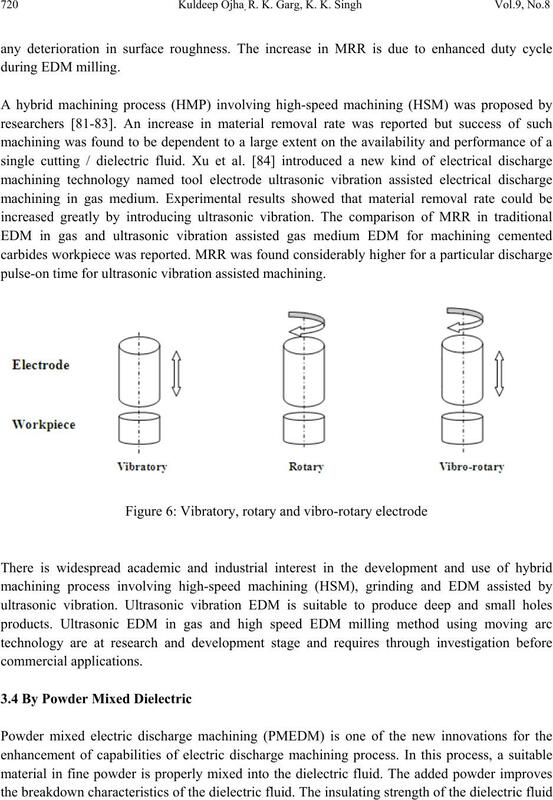 the employment of ultrasonic vibration is mainly due to improvement in dielectric circulation. EDM in semi finishing. Fig. 6 shows difference in Vibratory, rotary and vibro-rotary electrodes. workpiece vibration, tool vibration with electrode rotation. pulse-on time for ultrasonic vibration assisted machining. 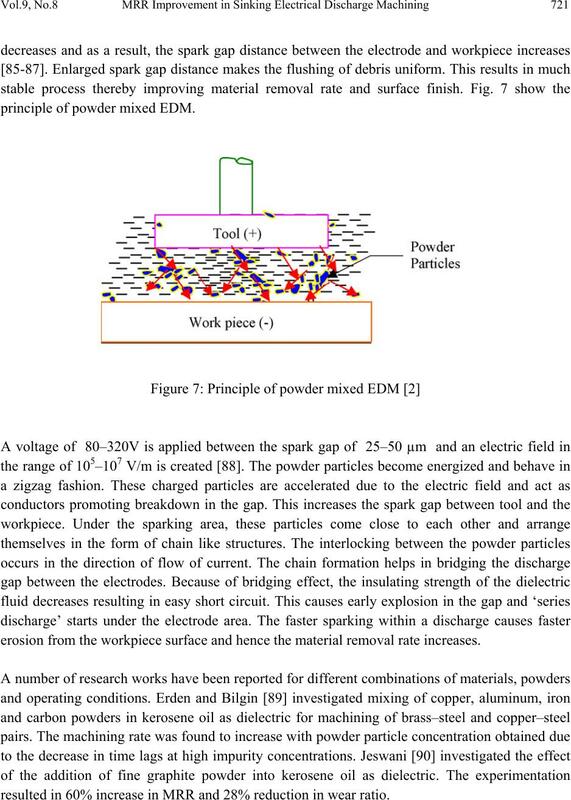 principle of powder mixed EDM. erosion from the workpiece surface and hence the material remo v al r a te i n cr ea ses. resulted in 60% increase in MRR and 28% reduction in wear ratio. restricted its frequent use . developments in this variation have been discussed in previous section 3.3.
water rather than in kerosene. obtain higher removal rates and lower energy consumption compared with conventional EDM. than those of conventional EDM in which there is only on e di sc ha rg e point for each pulse. workpiece rotates at 8 rpm. The industrial/ commercial relevance of these approaches are mentioned in section 4.
and also to find solutions to the assumptions made by researchers. frame type and plate type are yet to be tried for more work-tool interfaces. surface roughness etc. has to be explored for more work materials. work materials to evaluate their cas e to ca se ef fe ct s.
of these parameters while machining may be evaluated for more work materials. published work is reported on composites and harder materials like alumina and ceramics. 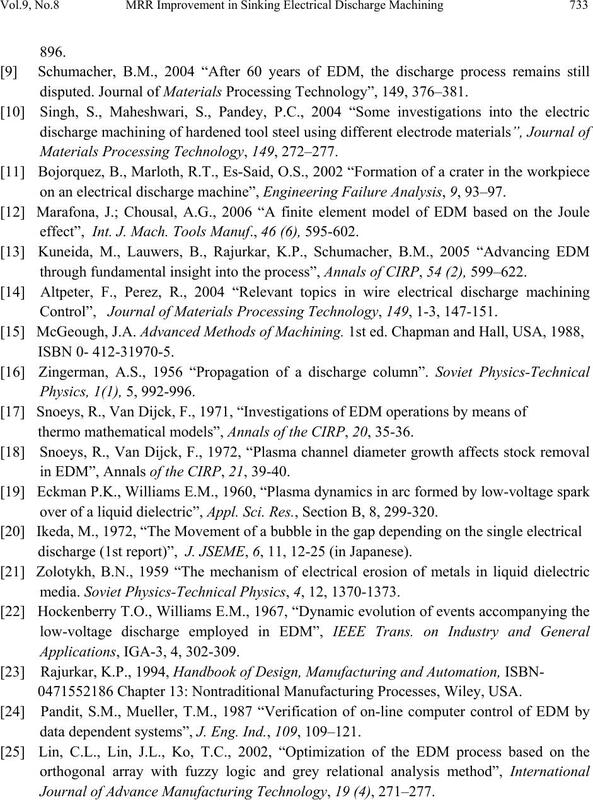 few published papers on vibro-rotary EDM for different work materials. assisted EDM. 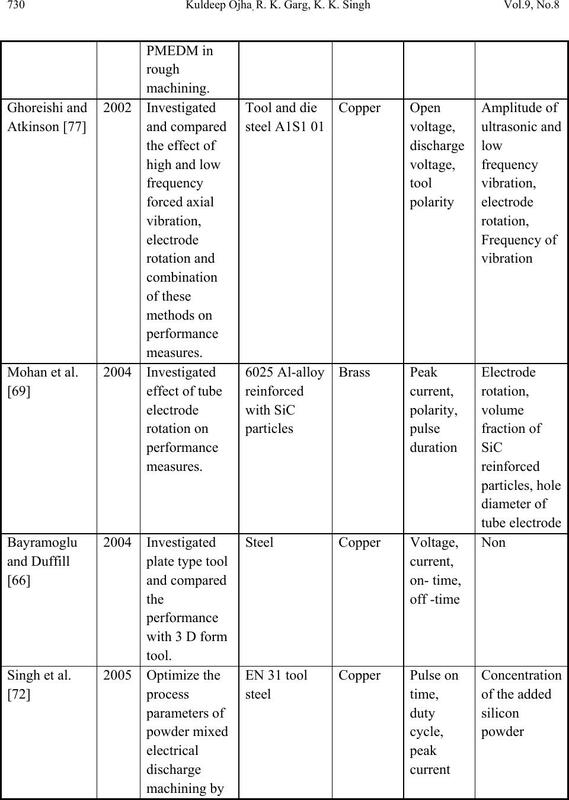 Other electrode materials need to be investigated thoroughly. electric discharge machining. The same may be tried in future works. EDM and EDM milling may be tried for optimization of MRR, EWR, surface roughness etc. 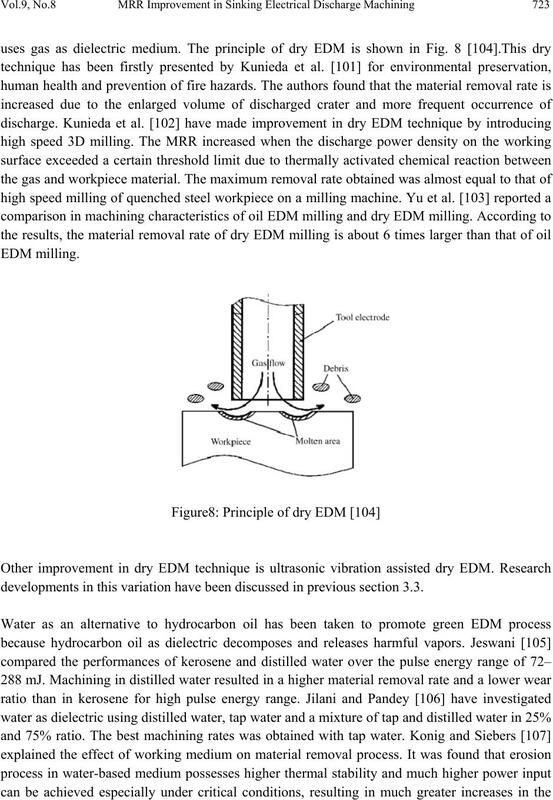 techniques of MRR improvement with same/different work materials in EDM. study/experimentat ion /mod eli ng i n f utu re. Int. J. Mach. Tools Manuf., 43, 1287–1300. topography”, Journal of Materials Processing Technology, 148,155–164. disputed. 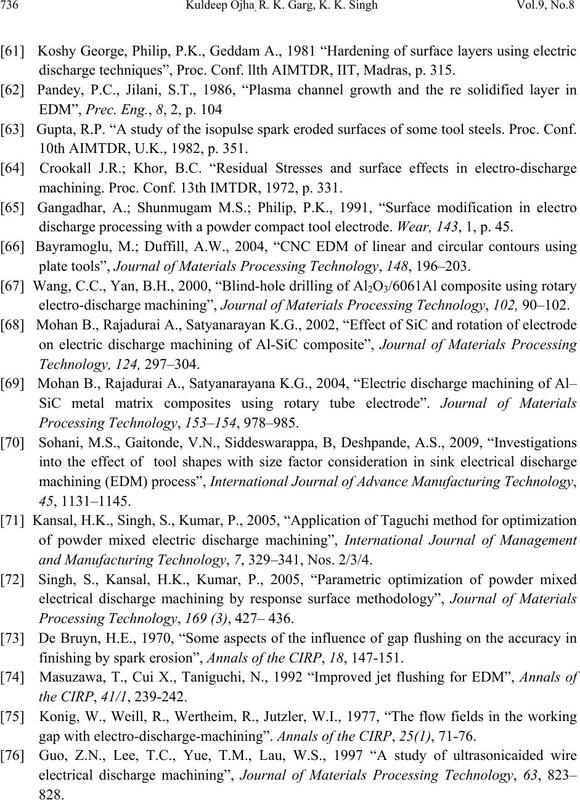 Journal of Materials Processing Technology”, 149, 376–381. Materials Processing Technology, 149, 272–277. on an electrical discharge machine”, Engineering Failure Analysis, 9, 93–97. effect”, Int. J. Mach. Tools Manuf., 46 (6), 595-602.
through fundamental insight into the process”, Annals of CIRP, 54 (2), 599–622. 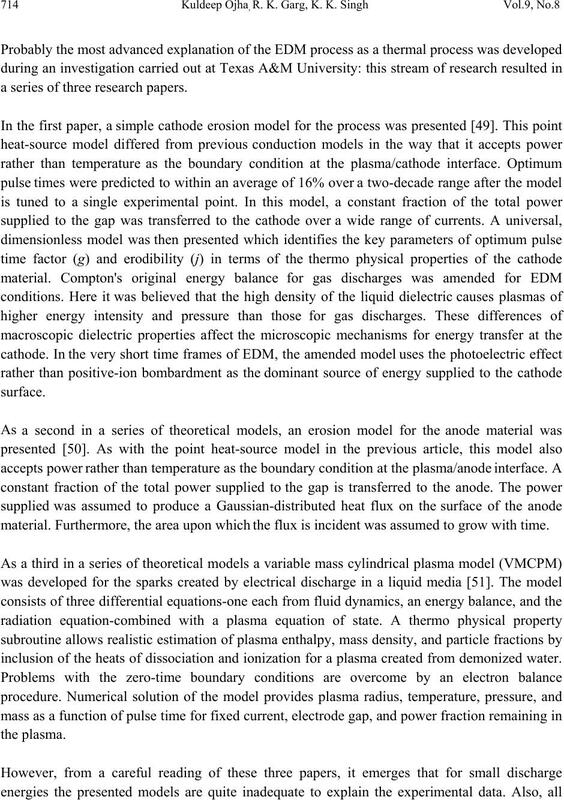 Control”, Journal of Materials Processing Technology, 149, 1-3, 147-151.
thermo mathematical models”, Annals of the CIRP, 20, 35-36.
in EDM”, Annals of the CIRP, 21, 39-40.
over of a liquid dielectric”, Appl. Sci. Res., Section B, 8, 299-320.
discharge (1st report)”, J. JSEME, 6, 11, 12-25 (in Japanese). media. Soviet Physics-Technical Physics, 4, 12, 1370-1373. 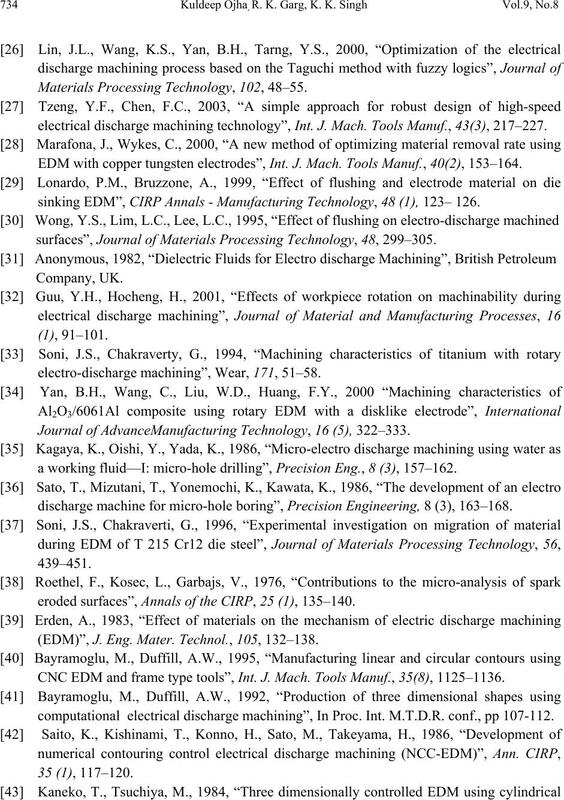 0471552186 Chapter 13: Nontraditional Manufacturing Processes, Wiley, USA. data dependent systems”, J. Eng. Ind., 109, 109–121. 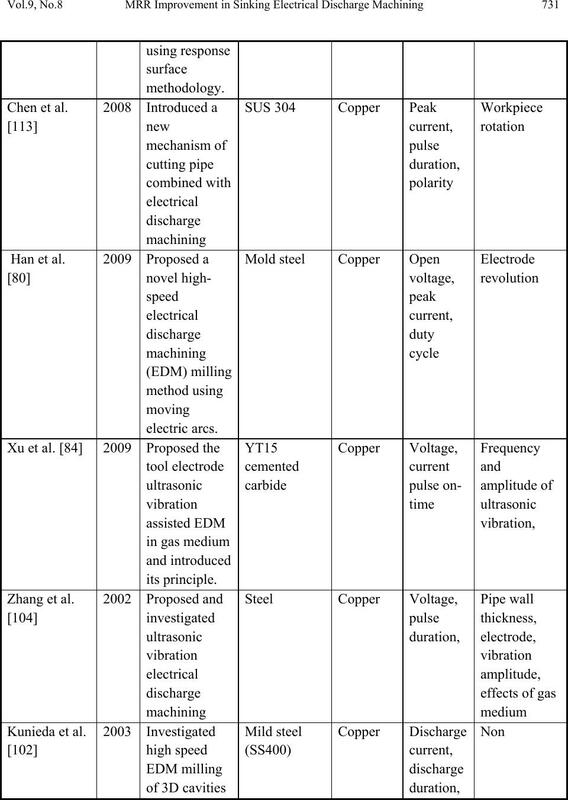 Journal of Advance Manufacturing Technology, 19 (4), 271–277. Materials Processing Technology, 102, 48–55. electrical discharge machining technology”, Int. J. Mach. Tools Manuf., 43(3), 217–227. EDM with copper tungsten electrodes”, Int. J. Mach. Tools Ma n u f., 40(2), 153–164. 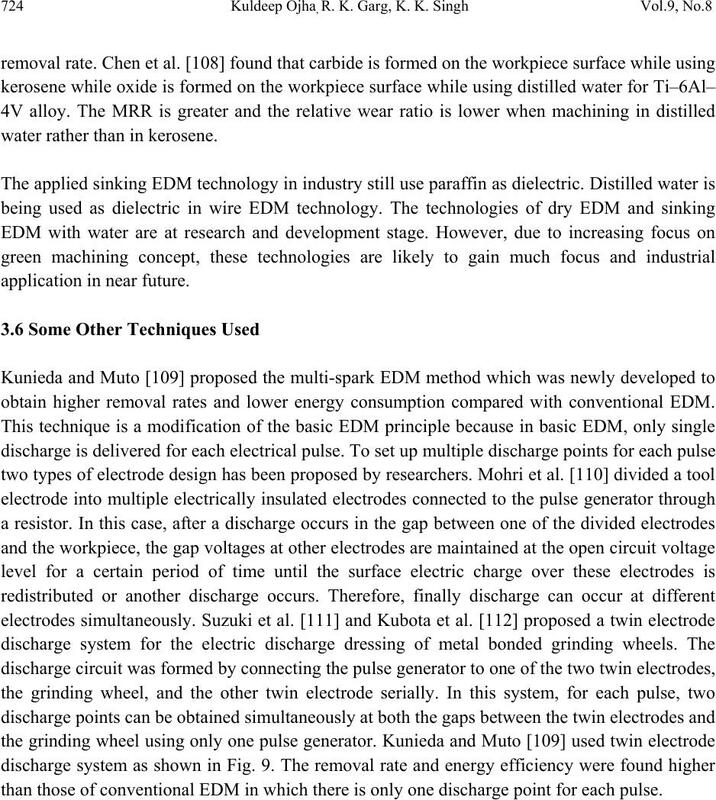 sinking EDM”, CIRP Annals - Manufacturing Technology, 48 (1), 123– 126.
surfaces”, Journal of Materials Processing Technology, 48, 299–305. electro-discharge machining”, Wear, 171, 51–58. Journal of AdvanceManufacturing Technology, 16 (5), 322–333. a working fluid—I: micro-hole drilling”, Precision Eng., 8 (3), 157–162. discharge machine for micro-hole boring”, Precision Engineering, 8 (3), 163–168. eroded surfaces”, Annals of the CIRP, 25 (1), 135–140. 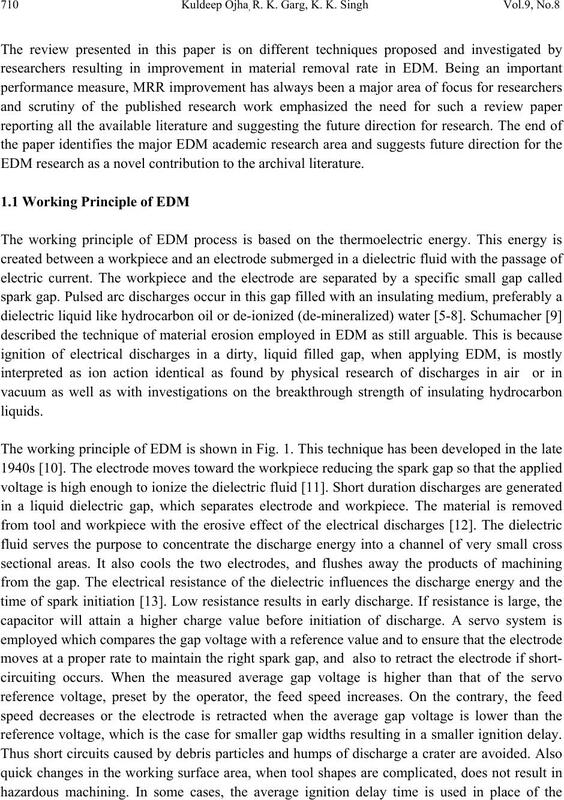 (EDM)”, J. Eng. Mater. Technol., 105, 132–138. CNC EDM and frame type tools”, Int. J. Mach. Tools Manuf., 35(8), 1125–1136. computational electrical discharge machining”, In Proc. Int. M.T.D.R. 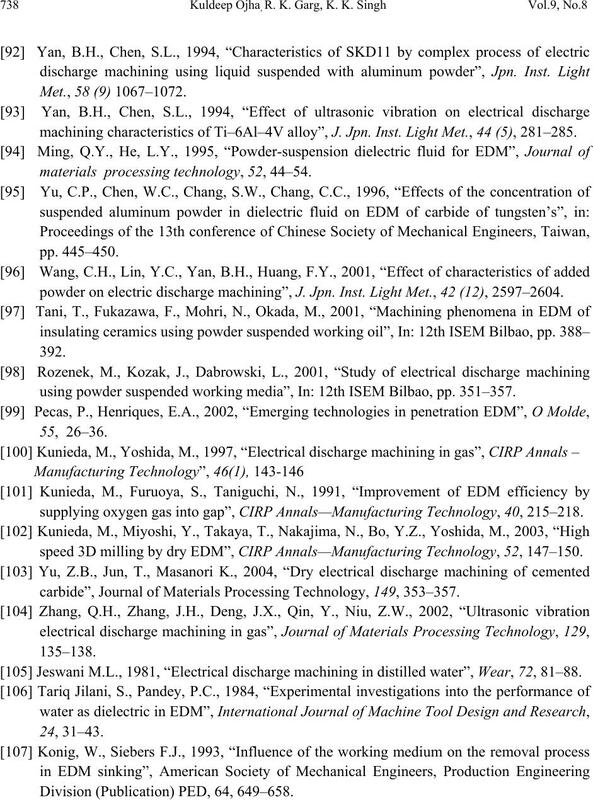 conf., pp 107-112.
electrode”, J. Japan Soc. Electr. Machining Eng., 18 (35), 1–4. discharge machining”, Ann. CIRP, 44 (1), 165–168. machining techniques”, Ann. CIRP, 35 (2), 467– 480. EDM”, Ann. CIRP, 38 (1), 187–190. surface quality”, Proceedings of the ISEM-7, 124–135. Dijck, F.V. 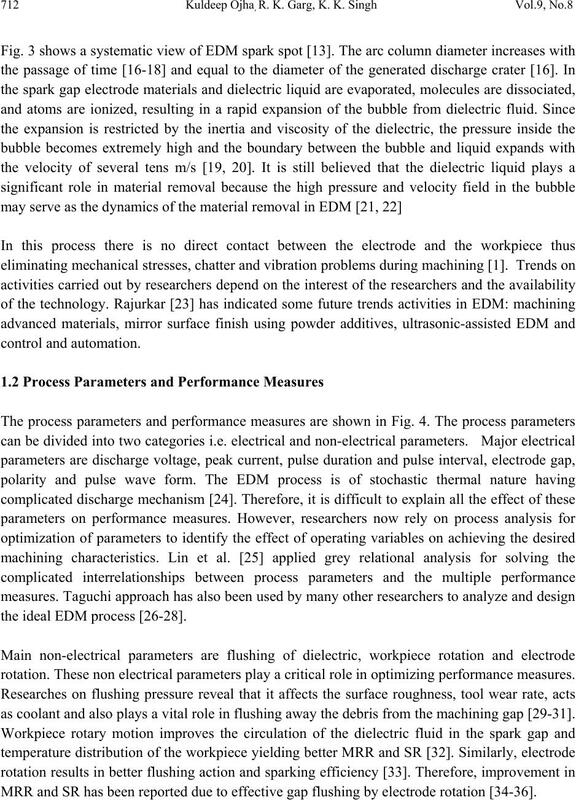 Physico-mathematical analysis of the electro dicharge machining process. Ph.D. Thesis Katholieke Universiteit te Leuven. Around 1972. Applied Physics, 66, 4095- 4103. 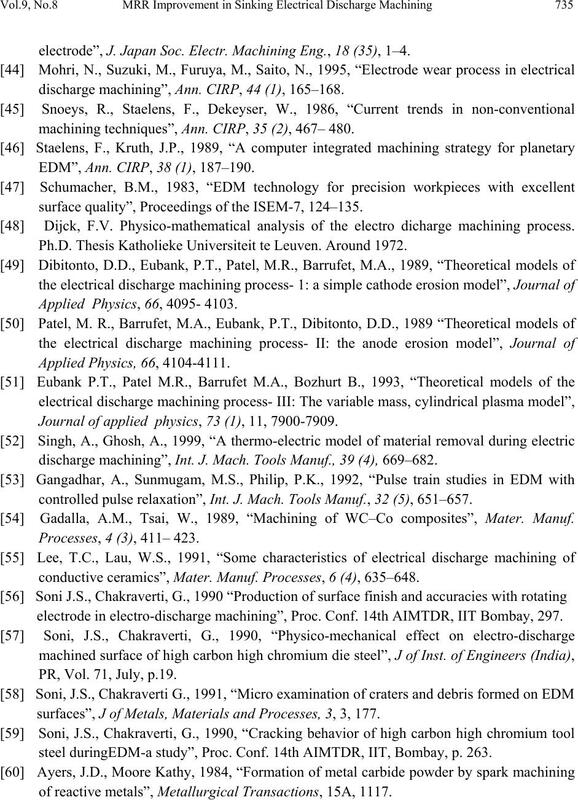 Journal of applied physics, 73 (1), 11, 7900-7909.
discharge machining”, Int. J. Mach. Too ls Manuf., 39 (4), 669–682. controlled pulse relaxation”, Int. J. Mach. Tools Manuf., 32 (5), 651–657. Gadalla, A.M., Tsai, W., 1989, “Machining of WC–Co composites”, Mater. Manuf. Processes, 4 (3), 411– 423.
conductive ceramics”, Mater. Manuf. Processes, 6 (4), 635–648. electrode in electro-discharge machining”, Proc. Conf. 14th AIMTDR, IIT Bombay, 297. PR, Vol. 71, July, p.19. surfaces”, J of Metals, Materials and Processes, 3, 3, 177.
steel duringEDM-a study”, Proc. Conf. 14th AIMTDR, IIT, Bombay, p. 263.
of reactive metals”, Metallurgical Transactions, 15A, 1117.
discharge techniques”, Proc. Conf. llth AIMTDR, IIT, Madras, p. 315. Gupta, R.P. “A study of the isopulse spark eroded surfaces of some tool steels. Proc. Conf. 10th AIMTDR, U.K., 1982, p. 351.
machining. Proc. Conf. 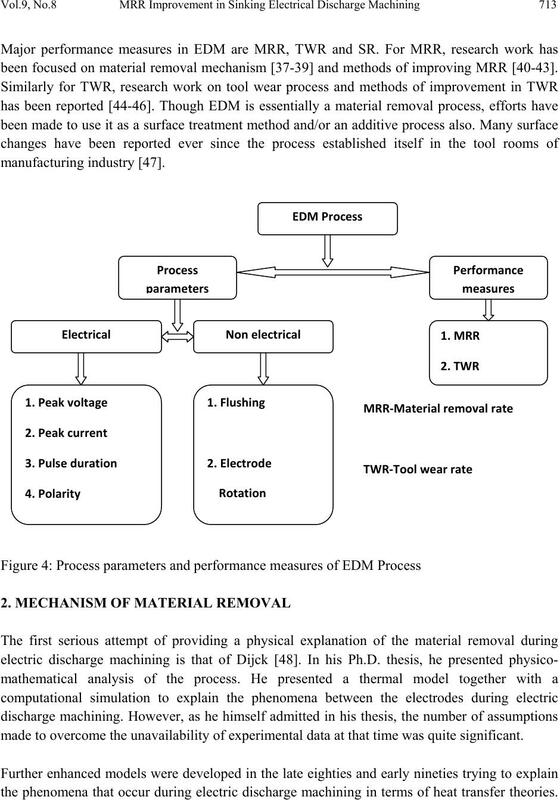 13th IMTDR, 1972, p. 331.
discharge processing with a powder compact tool electrode. 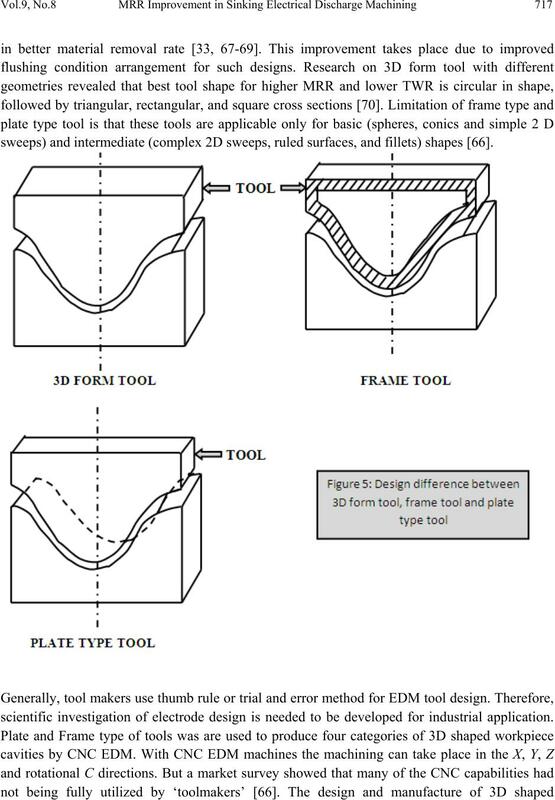 Wear, 143, 1, p. 45.
plate tools”, Journal of Materials Processing Technology, 148, 196–203. 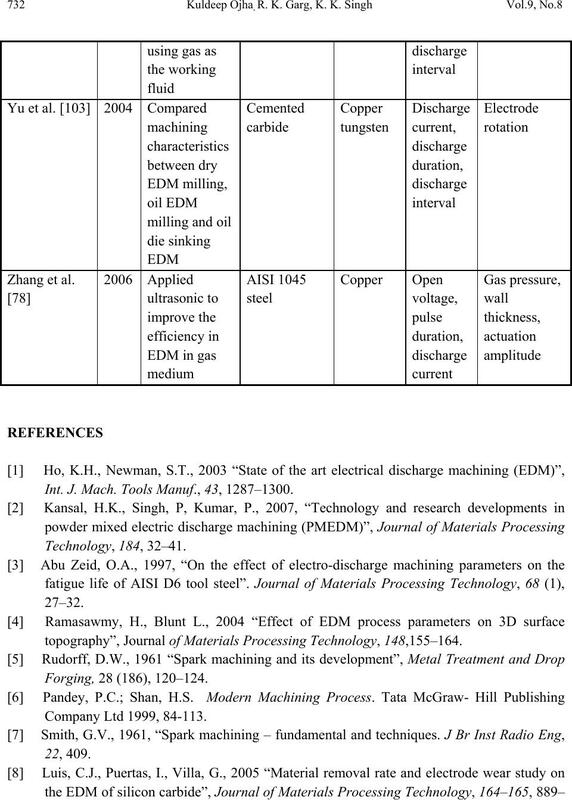 electro-discharge machining”, Journal of Materials Processing Technology, 102, 90–102. and Manufacturing Technology, 7, 329–341, Nos. 2/3/4. 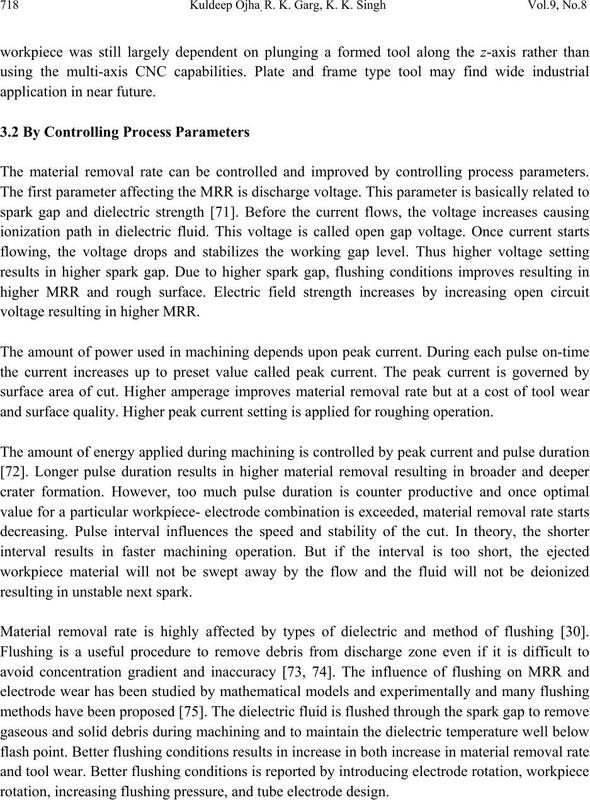 Processing Technology, 169 (3), 427– 436.
finishing by spark e rosion”, Annals of the CIRP, 18, 147-151.
gap with electro-discharge-machining”. 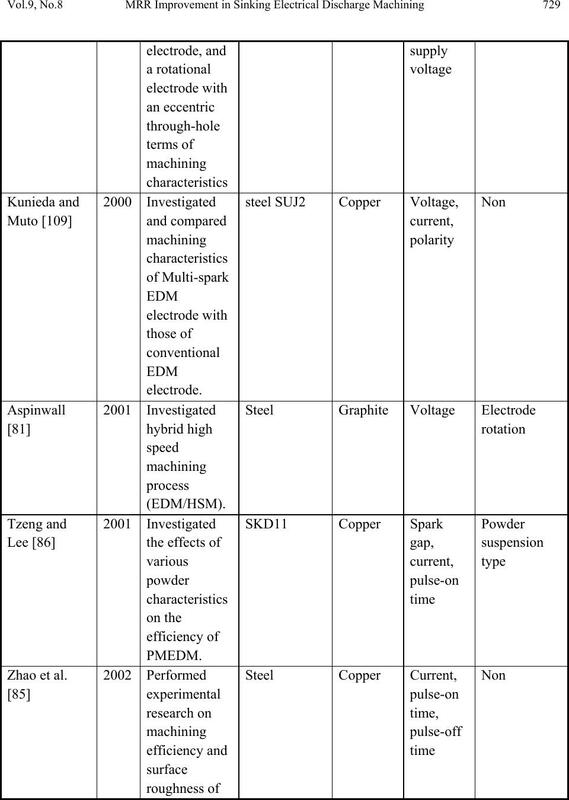 Annals of the CIRP, 25(1), 71-76.
of Materials Processing Technology, 120, 374–384. electrical discharge machining in gas”, Int. J. Mach. Tools Manuf., 46, 1582–1588. Material Processing, 14–15 March 2006, Kuala Lumpur, pp. 133–138. EDM/HSM. Ann. CIRP, 50 (1), 145–148. Journal of materials processing technology, 209, 1742–1746. 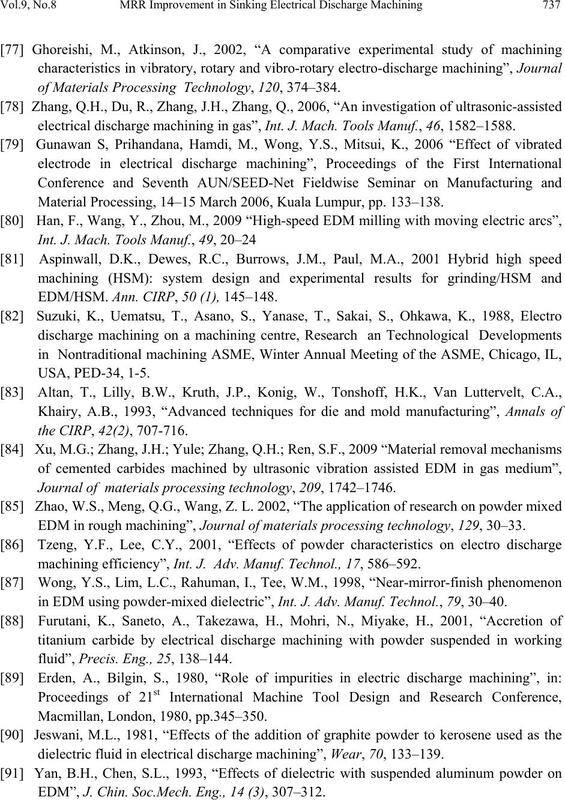 EDM in rough machining”, Journal of mat eri als p roc ess ing te chn olo gy, 129, 30–33. machining efficiency”, Int. J. Adv. Manuf. Technol., 17, 586–592. 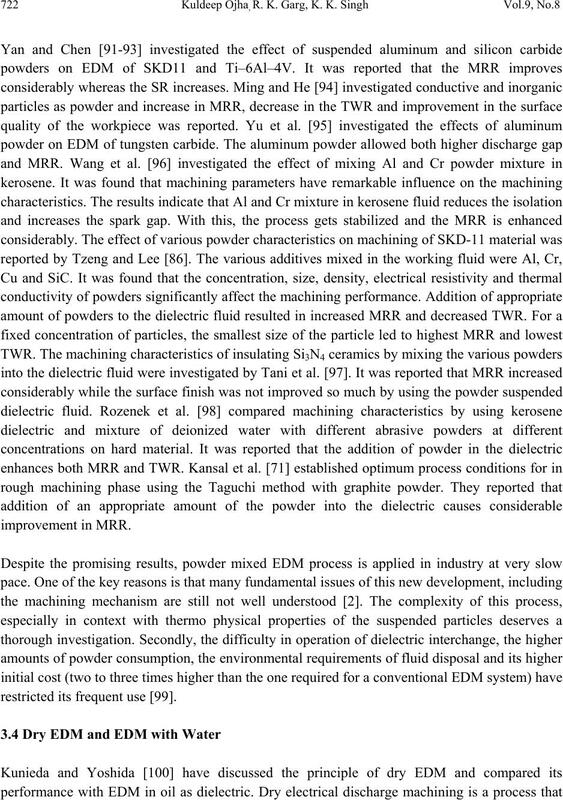 in EDM using powder-mixed dielectric”, Int. J. Adv. Manuf. Technol., 79, 30–40. fluid”, Precis. Eng., 25, 138–144. Macmillan, Lon don, 1980, pp.345–350. 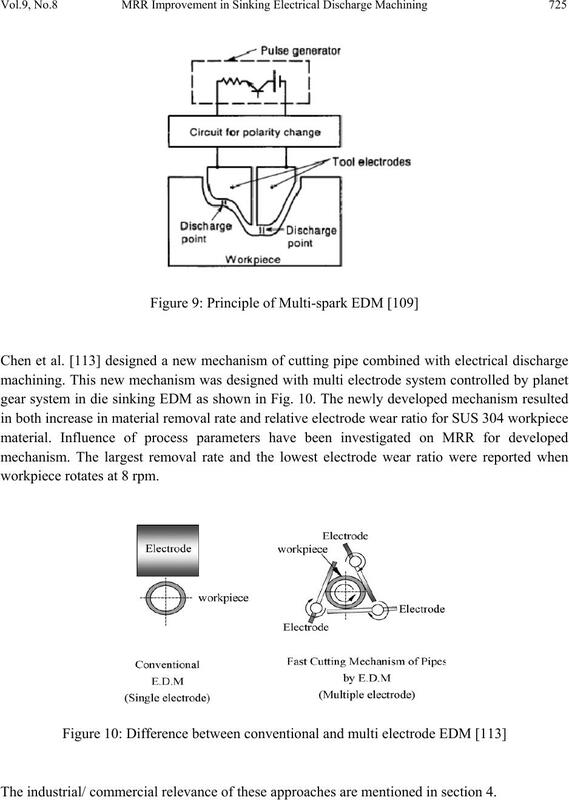 dielectric fluid in electrical discharge machining”, Wear, 70, 133–139. EDM”, J. Chin. Soc.Mech. Eng., 14 (3), 307–312. machining characteristics of Ti–6Al–4V alloy”, J. Jpn. Inst. Light Met., 4 4 (5), 281–285. materials processing tec h n ology, 52, 44–54. 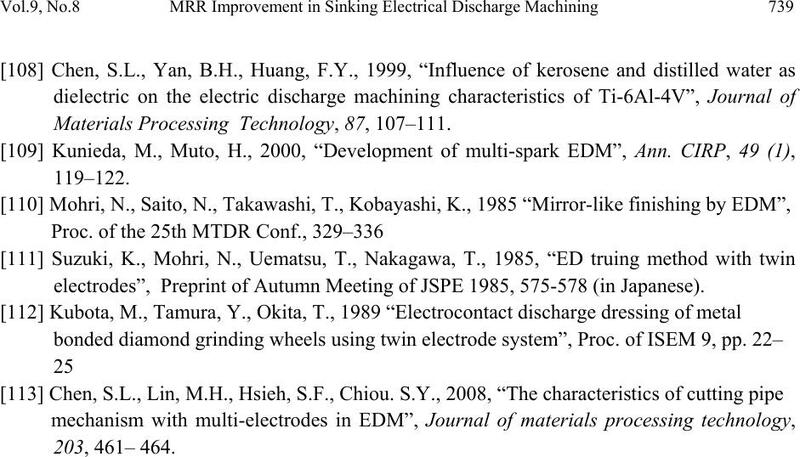 powder on electric discharge machining”, J. Jpn. Inst. Light Met., 42 (12), 2597–2604. using powder suspended working media”, In: 12th ISEM Bilbao, pp. 351–357. supplying oxygen gas into gap”, CIRP Annals—Manufacturing Technology, 40, 215–218. speed 3D milling by dry EDM”, CIRP Annals—Manufacturing Technology, 52, 147–150. carbide”, Journal of Materials Processing Technology, 149, 353–357. Jeswani M.L., 1981, “Electrical discharge machini ng in distilled water”, Wear, 72, 81–88. Division (Publication) PED, 64, 649–658. Materials Processing Technology, 87, 107–111. electrodes”, Preprint of Autumn Meeting of JSPE 1985, 575-578 (in Japanese).